Barcelona has always been an advanced city in all aspects but if we have to highlight only one it would be its architecture. In the 19th Century classic Renaissance buildings started coexisting with Gaudi’s modernist works as well as with the less-known Puig i Cadafalch. Later on the futurism of Foster and other architects changed Barcelona’ skyline in a vertiginous way. Nowadays it is one of the most visited cities by thousand tourists attracted by its architectonic value. We have tried to make a compilation of the most curious buildings of the city in a ranking of modern architecture. Here is the first part ! It couldn’t be otherwise, La Pedrera tops the list for both: its history and its spectacular beauty. It’s unique in the world. Sttill under construction since 1884 and no end date, the Sagrada Família was named a World Heritage Site by UNESCO in 2005 and is the most visited building of the architect Antoni Gaudi. There are many names given to this office building located in the district of Sant Martí. The tower is famous for its lighting, which varies during the year. It has a height of 144 meters, 38 floors, including 4 underground, and is the third tallest building in the city. It keeps a fairly obvious similarity with the Swiss Re Tower in London, which was designed by Norman Foster. Another jewel located in the Passeig de Gracia. This building, designed by Puig i Cadafalch for Antonio Costa,- a businessman of the chocolate industry- mixes Catalan Gothic style with influences of urban palaces of the Netherlands. A curious feature is the façade resembling a chocolate tablet. 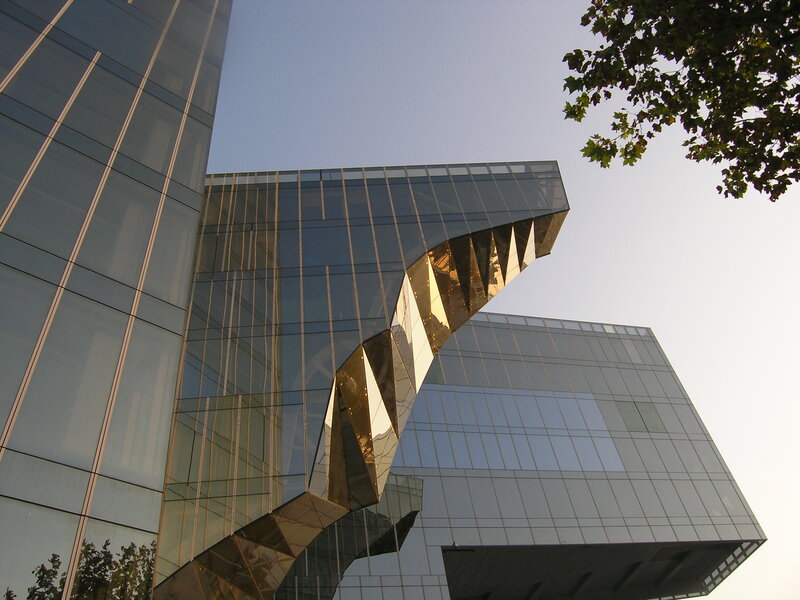 This buildings in the first sea line of Barcelona was awarded with the Costrumat Award in 2007 because of the technological innovation and originality of the project. The set consists of two towers of 17 and 25 floors and other of 4. The most striking are the aluminum mobile shutters, giving this vision always different and original. This is one of the most ambitious and impressive projects in Barcelona. It is situated on the seafront and has transformed the skyline of the city. The tower is 100 meters high and consists of two office buildings. The most interesting aspect of this work is that depending on the angle from which you look at they seem totally different. The legendary coffee-theatre has gone through the hands of several architects since 1910. The new design only keeps the facade with the legendary mill that gives its name in reference to the Moulin Rouge in Paris. The market, located in the heart of the Born is well-known for its colorful roof, stamped with a mosaic of the artist Toni Comella, who has drawn fruits and vegetables in 67 different colors. This unique building is located in Fira Gran Via, on the boundaries of Barcelona with L’Hospitalet. It is known for its lotus shape and its 41 floors and 110 meters high. Noted for its brightness and when you see it from the distance it seems to be velvet! Forum Building, which now houses the Museum of Natural Sciences “Blau”. It was the icon of the Forum of Cultures held in 2004. Its triangular structure is 180 meters long and 25 meters high and its ceiling is covered by a sheet of water that represents the Mediterranean.